Our family at Prép is always growing! With the busy Summer season, we have added a few more members to the team! These brilliant ladies will be starting out at the introductory JR price as listed below and will be for the duration of the rest of August and September. 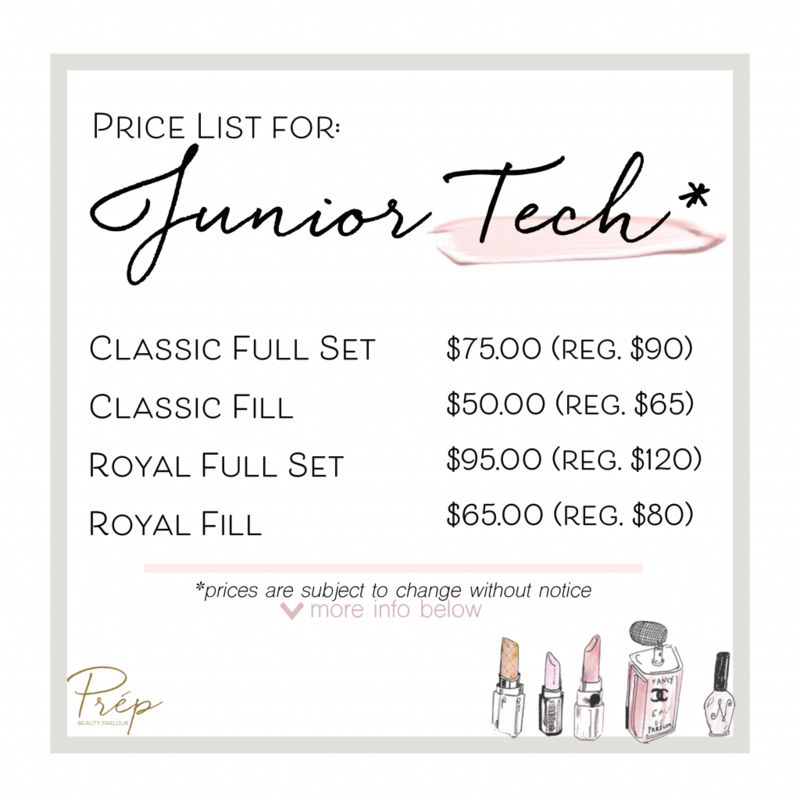 Starting October 2018, appointments with our Jr. technicians will revert back to regular pricing. 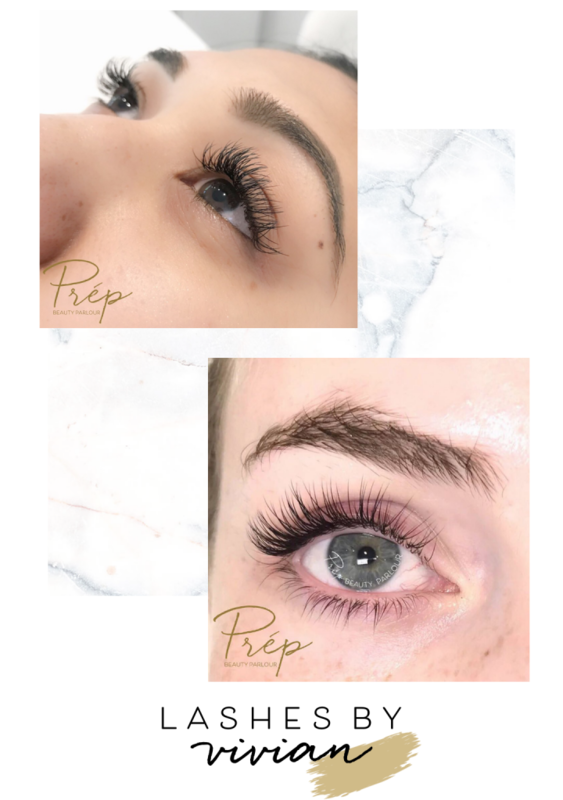 Our JR technicians are those who have recently graduated from lash academies and are looking to gain more experience performing lash services on different client eye shapes and styles. 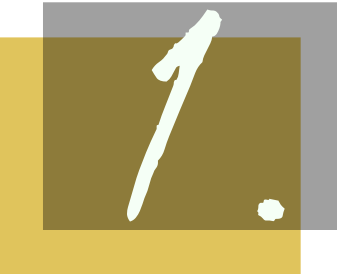 The duration of appointments for our Junior technicians are longer than those of regular appointments. They will be 2 hours for a full set instead of 1.5 hour, and will be 1.5 hour for fills rather than 75 minutes. We are excited to have our new technicians on board and are extremely grateful for all of our lovely clients and their support in their learning process! Eyelash extensions have been all the rave all year, and is definitely on our Summer #MUST-HAVE list! They’re amazing for the hot weather, where you can enjoy the nice summer breeze on the beaches of Kitsilano, and go swimming all you want at English Bay! (Click here to read more about showing some summer lash love!). For the glam ladies who love a full, voluminous look, today’s topic is just for you! For starters, there are many types of styles, classics, royals, and the ones that are constantly trending on Insta– Russian Volume sets! Keep reading to read about our special July promotion for you ladies to enjoy this summer! There are so many gorgeous pictures and #lashinspo all over multiple social media outlets- and if you’re like us and like to go crazy and read all about them, you’re at the right place! 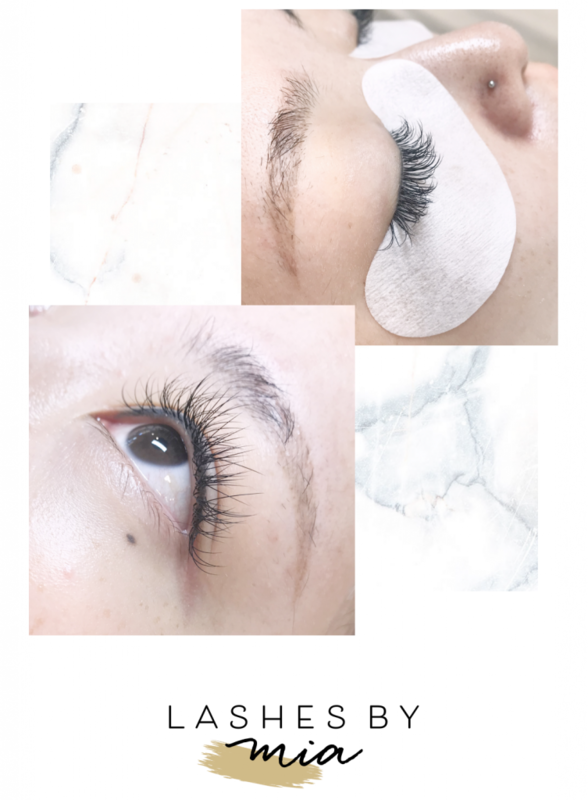 With so many choices and lash extension specialists in Vancouver, how do you know what to look for when picking your new lash bae? 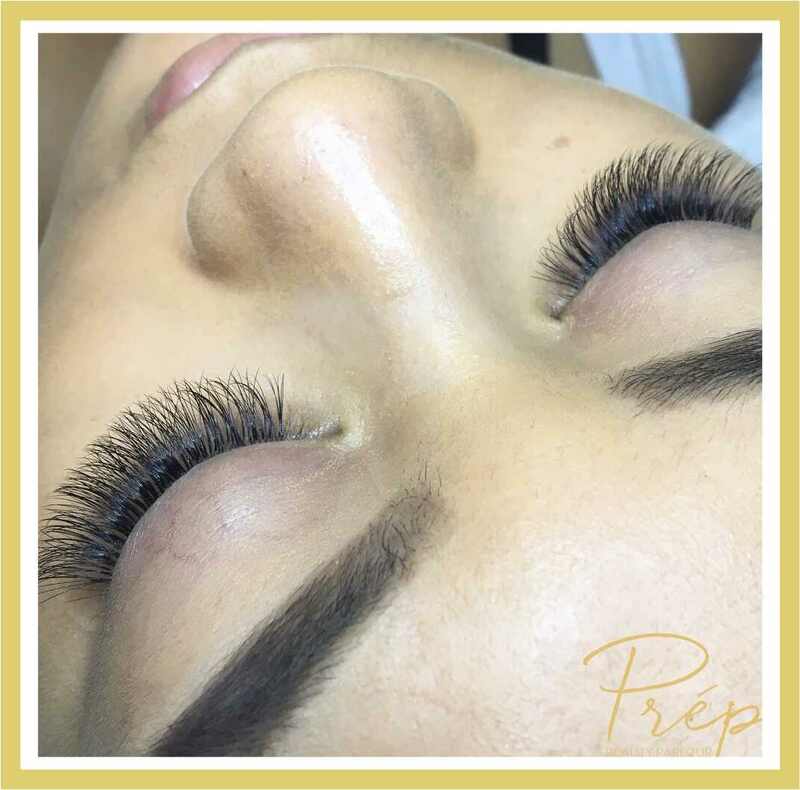 Particularly with getting volume lashes, one must be very careful when picking and making sure you’re with a certified technician. Don’t be fooled by the photos! Although some may look very appealing, it can be in fact, very damaging for your natural lashes! Here are several things to look for when browsing through their Yelp photos! Check the amount of time they are taking for a full set of Russian Volume lashes. 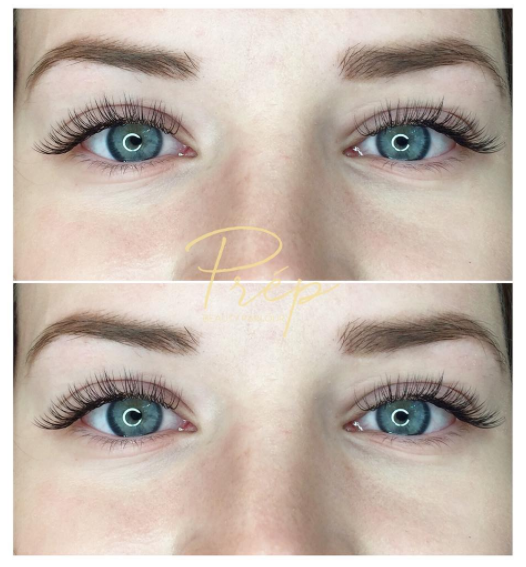 At Prép, a full Russian Volume 3-D set means that 3 synthetic lashes are carefully crafted by your Prép technician. This service can take up to 3 hours and if not, even more! 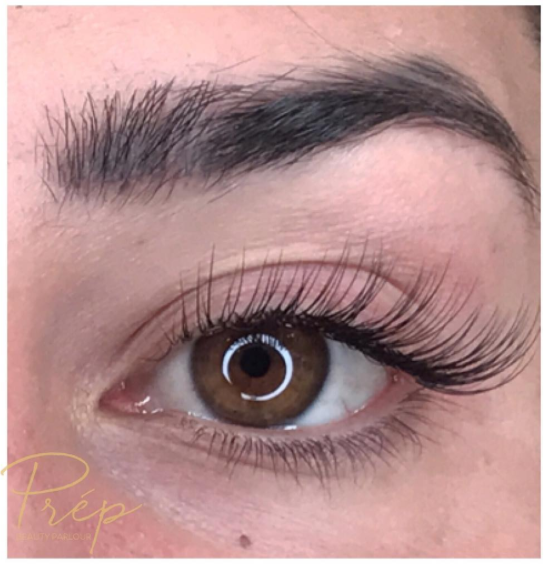 If the amount of time they have you booked in for a Russian Volume 3D Full set is approximately 1-2 hours, then there is a possibility that they are using pre-made, store bought clusters on your lashes! Read more below! 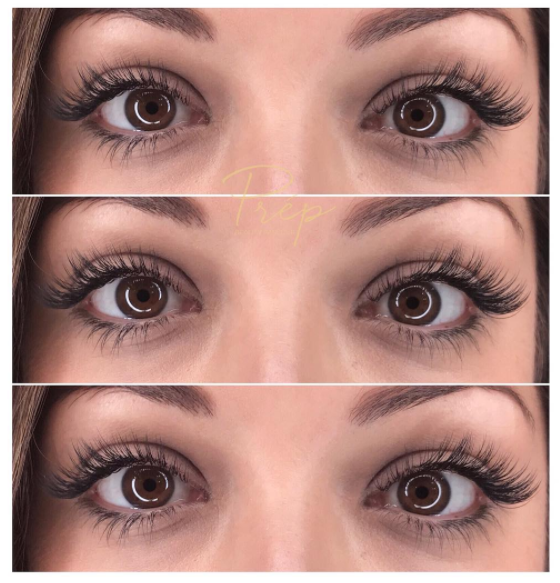 So what is the difference between volume lashes and cluster lashes ? Look at their photos! No photos? No excuses! It is super important that you are able to look at the lashes up close for anything that might be a red flag! For example? Look at the base to check if they are using pre-made fans, or if they are hand made, true Russian Volume lash fans! Examples below! 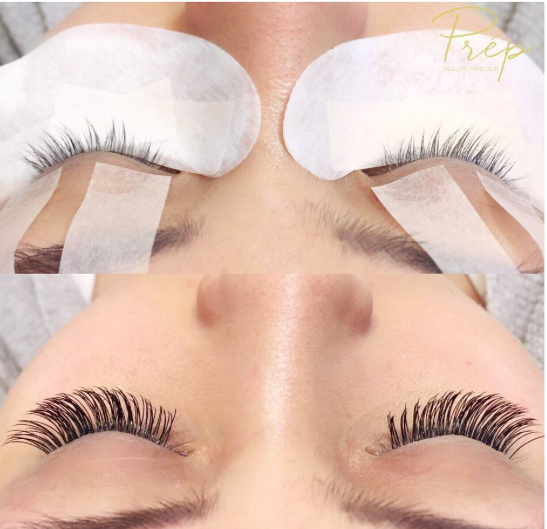 Pictured above: Example of “Russian Volume Lashes” not done by Prép Beauty Parlour! Several things are major warning signs for these lashes! 1- You can clearly tell these are pre-made, store bought clusters from the way they are lumpy at the bottom of the lashes. Notice how the clump is on several very thin natural lashes? Shiver!! 2 & 4- Not only do we see the overuse of lash glue on these lashes, but also the fact they are on the eyelid, directly on the skin! Lashes should never be applied on the skin! This can cause severe irritation. The lashes will damage the natural lashes underneath if it starts to grow and pull away from other lashes! 3- If the picture of the Russian Volume lashes have lashes as thick as these, stray away! Think about it this way, the weight of 3(sometimes up to 8D!) lashes should be equivalent to those of 1 classic lash! If a volume set is being built with so many thick lashes, it will be too heavy for the natural lashes to endure! Meaning more lash fall out!! Got anymore questions about picking your new volume lash specialist? Give us a call at 604-764-6452! We would love to answer all of your questions for you! To book an appointment online, click HERE! Now for our special JULY offer, book with Gillian for any Volume sets (Mixed or Full Russian), for $50 off! Summer is FINALLY on it’s way! (Or so our calendar says… Vancouver weather says otherwise..), so what does this mean? It means beaches, deep forest adventures, late night bonfires, and morning jogs at the seawall of course! With all of these activities, plus our vitamin-D giving friend Mr. Sun, wearing strip lashes the entire day is a big no-n0. Why? Not only is it uncomfortable to wear strip lashes all day, but just imagine that mascara running down your cheeks on the hot summer day! Absolutely dreadful! Our solution? Nothing other than to treat yourself to a new set of fluffy lashes! Unlike strip lashes, lash extensions are completely waterproof, fool proof- allowing you to enjoy your favourite summer activities at ease! Many of you might ask, “so how can I keep them looking their best even through my sweaty runs?”, don’t ever fret, your local bestie, Prép team is here to guide you through a long summer of sunset escapes! Okay, but regardless of whether you’re diving in and out of the pool or not, always cleanse and rinse your lashes! Rinsing your lashes gets rid of the buildup that’s been living on them- aka, dust, pollutants, makeup (if you’re a sneaky mascara wearer!!!). Not only does it cause your lashes to fall out faster, but can also cause very nasty blepharitis! Particularly in the summer, we strongly recommend that you cleanse your lashes after swimming! This is where chlorine, salts, and other chemicals will cause even more build up than usual! Summer means tons of bonfires and creating moments near the ocean! Camp songs, selfies, everything seems great! Until you get too near the fire! Since your lash extensions are made of a synthetic material, the ends will look burnt and crinkly if too close to the heat! The same thing goes for those family BBQ nights! 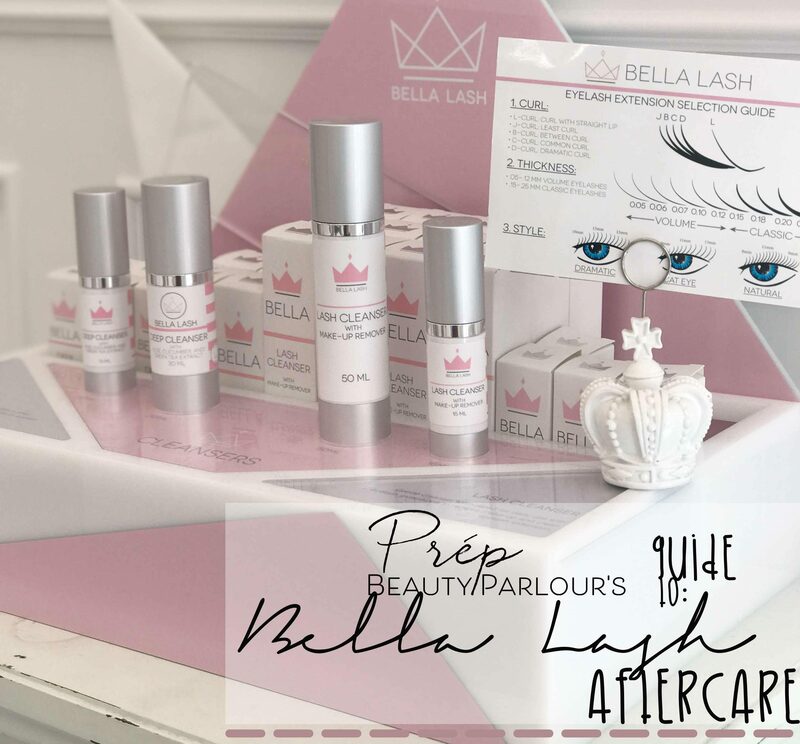 It is always important to remember that a big part of making sure your lashes last, is to take proper care of them! Besides cleansing daily, this also means to brush them everyday with your spoolie to remove all the build up of dust that might have collected on your lashes! It also helps to brush from the top down to remove any tangles your lashes might have ended up in. If you’re like us and like to wear make-up on top of your lash extensions to give it that extra kabam, we would highly recommend you only use our Volume Touch Mascara. Since it is made and formulated for lash extensions, it is free of oils and calls for a easy removal! If you want to wear eyeliner as well as other make- up, we would say to use only oil free makeup, as well as eyeshadow or powder makeup! Just remember, oil and lash extensions are not friends! Lastly, but never, ever least- sunscreen! Wearing sun screen is a definite MUST! It is super important to protect our skin from UV rays to prevent skin cancer as well as wrinkles and fine lines caused by overexposure of the sun. So yes- it is important to wear sunscreen while we’re enjoying fun summer activities, but how do our lashes like it? Again, as long as it is an oil free sun screen- feel free to use all the sunscreen you want at your disposal!